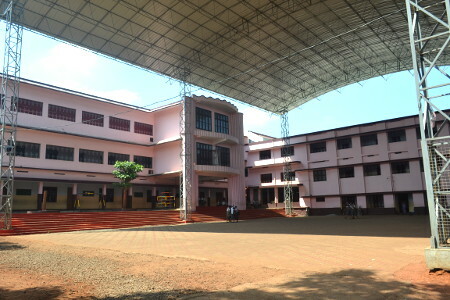 The School is comprised of LKG, UKG, Primary, High school and Higher Secondary level catering Kerala State Syllabus. Off late it has been started ICSE curriculum too. Here at Holychild they look at every student as exceptional and every child deserves the best education. Thus parents and teachers here work collectively to be the architects and builders to shape up their mind, character, personality and career goals by giving quality education which is stress free to their children. Considering the need of the people of Painattukara village then known as Mullankuzhy, a place near Kottackal Monastery Rev. Fr. Paul Kodiyan of the Monastry with some well wishers of the locality visited the provincial Rev. Sr. Clemance and informed her of their desire in getting a school started in the locality. It was sanctioned by Rt. Rev. Dr. James Pazhayattil, Bishop of Irinjalakuda, for starting a school and Rev. Fr. Paul Kodiyan himself took initiating getting a temporary house belonging to the monastery. Thus on 25th June 1979 "Holy Child Convent English Medium School" was blessed and nursery class was begun. With the ardent and the continual effort of the provincial Rev. Sr. Clemence, councillors Sr. Aurea and Sr. Clerisa, Fr. Paul Kodiyan and the well wishers of the locality, a plot of nearly five acres of the land was acquired near the newly begun school and a building was erected for the purpose of being used as a convent. Rev. Fr. Paul Kodiyan was responsible for the renaming of Mullankuzhy as Snehagiri. The number of Students increased and on 2nd June, 1980 LKG, UKG, and Std. 1st Classes were started in the palm leaves thatched shed adjacent to the newly built convent. From a humble origin of fifty students and two teachers the school though intersession of Holy Child has now became a unique one of its kind, standing like the gigantic statue of the happy prince. In 2002 the School became Higher Secondary School with Government sanction to start science and commerce at Higher Secondary level. The Spiritual and physical quantitative and qualitative endeavors which Rev. Sr. Bindu began crossed a milestone when Rev. Marian took charge in 1996, the fruits of which were reaped in the succeeding years especially during the period of Rev. Sr. Senthi's headmistress-ship. In 2002 the school was crowned with 6th and 15th ranks besides the hat-trick cent percent of which more than half bagged high distinctions in the annual public examination. They received the Mother Theresa award for the best school in the district from Kerala Citizen's Forum.